Divine Mercy: 580 (47) On a certain occasion, the Lord said to me, I am more deeply wounded by the small imperfections of chosen souls than by the sins of those living in the world. 580 (47) On a certain occasion, the Lord said to me, I am more deeply wounded by the small imperfections of chosen souls than by the sins of those living in the world. It made me very sad that chosen souls make Jesus suffer, and Jesus told me, These little imperfections are not all. I will reveal to you a secret of My Heart: what I suffer from chosen souls. Ingratitude in return for so many graces is My Heart‟s constant food, on the part of [such] a chosen soul. though I am, I cannot help such a soul because it scorns Me; having a free164 will, it can spurn Me or love Me. 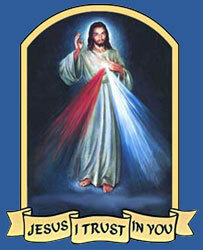 You, who are the dispenser of My mercy, tell all the world about My goodness, and thus you will comfort My Heart. 581 I will tell you most when you converse with Me in the depths of your heart. Here, no one can disturb My actions. Here, I rest as in a garden enclosed.